Justin and Keith are two sales reps working for a pharma company. Justin is a new hire whereas Keith is experienced. Though Justin received formal training on sales skills and product knowledge, he isn’t yet confident to handle a sales call. Hence, their manager asked Keith to accompany him on his debut call. On the way to the client, Keith received a call from another client, asking him to arrange a product demo the same day as they were interested in their product and most likely, willing to place an order. Keith had no option but to rush to the client’s place, leaving Justin in dismay. Justin reached the client but wished he had a handy app he could flip through that would boost his confidence before he met the client. Does this sound familiar to you? If yes, you should read on to learn how m-learning can save your sales reps, service technicians, and end-users by providing just-in-time solutions. M-learning implies delivering learning on mobile devices such as Smartphones, iPads, tablets etc. Here are some instances where m-learning comes handy to employees. Let’s see how. Keeping pace with constant product updates, growing customer needs, changing market trends, gaining competitor product knowledge, achieving sales targets, phew! Your sales reps have multiple tasks to focus on.When you want them to grasp so much in such a little time, you can’t depend on training techniques that demand a good amount of your reps’ time. Training them through lengthy training sessions that consume their field time is not an ideal option.So, m-learning modules that provide quick access to product updates can give them the information they seek, just-in-time. A UK based software company wanted to provide strategic guidance to help their sales people make the right pitch to their prospects. They took to mobile learning and provided an app that helped sales people obtain essential product information just-in-time, nurture leads better, and engage with existing contacts effectively, resulting in higher productivity. It also boosted the confidence of sales people as they had access to just the right information when facing customers. In the manufacturing sector, business revolves around production. The soundness of manufacturing equipment plays a significant role in ensuring uninterrupted production and thereby achieving the anticipated business outcomes. Employees therefore need to understand how to handle, operate, and maintain equipment on a daily basis. Improper handling of the equipment can lead to downtime that can gravely affect productivity. Hence employees need to receive regular training on equipment handling and maintenance. Your technicians might have been trained on this when they first joined the organization. But, it is a good practice to remind them of the key steps involved in the process as employees tend to improvise on their own or miss important steps while handling equipment or when doing regular maintenance. This is where m-learning can be of use. It can be used to remind workers of the best practices in maintenance and provide tips on basic trouble shooting. A huge firm had a team of engineers who had to travel to various client sites to carry out equipment maintenance tasks. It opted for a mobile app that provided support to the engineers in the form of safety updates, a basic troubleshooting guide and the latest company news. They didn’t have to carry bulky technical manuals for reference anymore and could refer the resources through their mobile devices. Though you train your end-users before you go-live with ERP in your organization, they may not be confident of handling the ERP initially.They may face doubts and difficulties that slow down the adoption of the new software system. 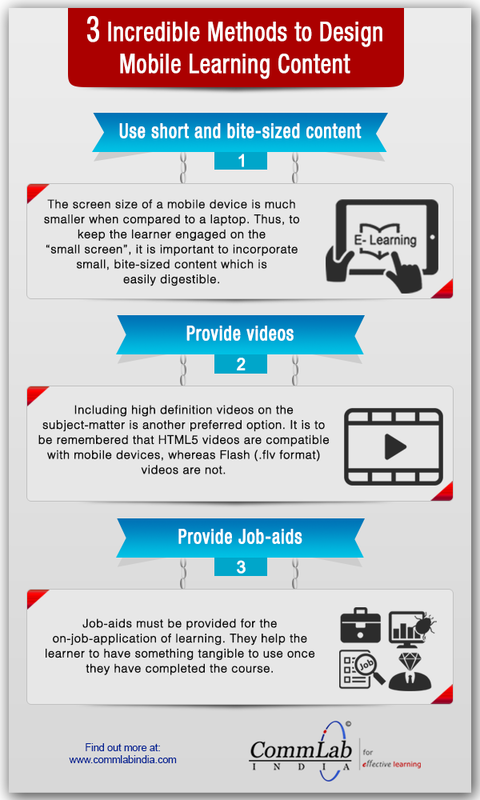 You can turn to m-learning videos that offer them on-the-job support. For example, each task in the ERP can be demonstrated through a video. Tasks such as “How to login”, “How to raise a sales invoice”, “How to check inventory for stock availability”, etc. can be developed as individual modules your end-users can access on their mobiles. This fills their knowledge gaps by offering just-in-time learning. The mobile careers of your sales reps demand on-the-job support and so do the employees from manufacturing and medical device sectors, for maintaining their equipment in good condition. M-learning fills skill gaps by offering right information at the right time. It also rescues ERP end-users from the ERP adaption blues. Hence, it can be considered one of the good options for performance support, if not, the sole option. How do you use m-learning in your organization? Do share with us.